Get started in minutes. Install vCard Wizard Contacts Converter on your PC and simple instructions will guide you through the process. 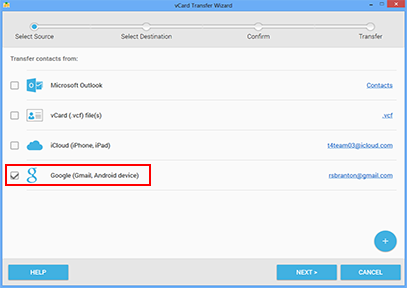 Import Gmail contacts to Outlook, iCloud (iPhone, iPad), vCard file or another Google account. Request additional source, e.g. CSV/XSL files, Office 365, SalesForce CRM, etc. Consolidate contacts from multiple iCloud/Google accounts and other sources. Filter selected contacts and remove duplicates in just a few seconds. 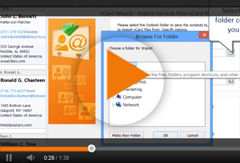 vCard Wizard Contacts Converter Pro Edition is the easiest way to import Gmail to Outlook or any other source. Choose the contacts you want to import from Gmail, confirm your selection and click Transfer. In just a few seconds, the contacts you have imported will appear in your Outlook contacts. Thousands of customers worldwide trust our vCard Wizard Contacts Converter. Excellent, does just what it says on the tin. Thoroughly recommend this application. Another winner from the4Team, thank you."